While conducting her Ph.D. thesis research, Bea Maas and her team (Maas et al. 2013) collected data that would surprise even her. When insect-eating bats and birds were excluded from cacao trees in Sulawesi, Indonesia, the crop yield fell by 31 percent. And when she compared losses due to night versus daytime exclusion, bats versus birds, she discovered that bats accounted for 22 percent of the prevented losses. A control site in the same study (poles without netting). 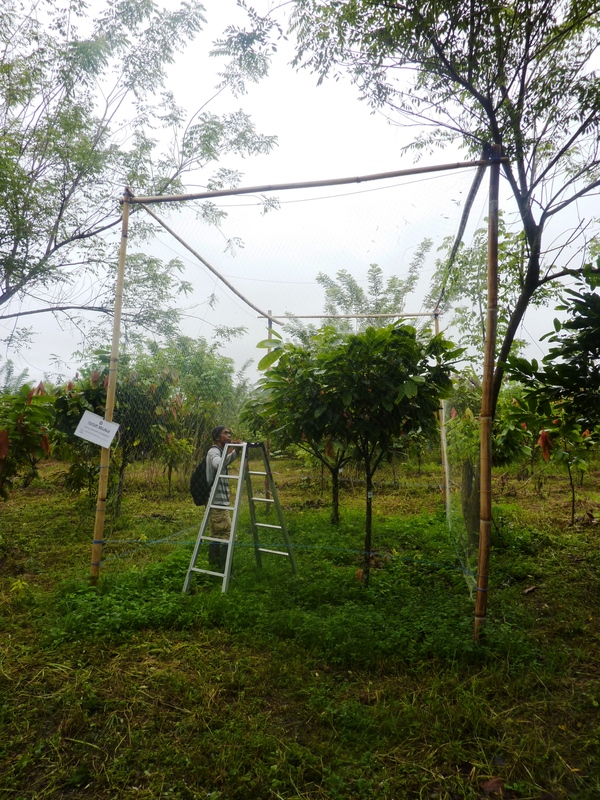 To obtain such data, Bea selected 15 plantations where she enclosed 120 cacao trees in 60 exclosures (like huge, mesh cages) constructed of nylon mesh. There were four exclosure treatments per plantation, one daytime, one nighttime, one day and night, and one always left open as a control. A bat/bird exclosure in Sarawak, Indonesia, built with bamboo poles and commercial nylon monofilament netting with a mesh size of 2 x 2 cm. These were opened and closed like curtains daily.